Here's a quick shot of the only conversion in my army so far. There are two guys like this, one for each 10 man squad. 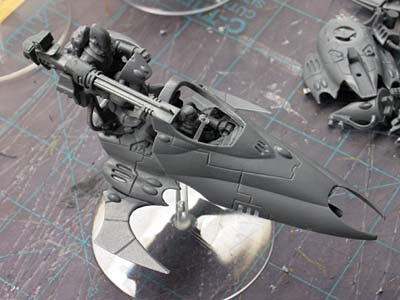 I decided I needed some way to tell which jetbikes had Shuriken Cannons and not just Catapults. And here's one of my Vypers. I haven't gotten it painted yet... that's this weekend hopefully. The Scatter laser is just pinned in place so I can change weapon loadouts later on once I better learn what I'm doing. The pointy-ears are coming along nicely! Gorgeous! I love the markings! 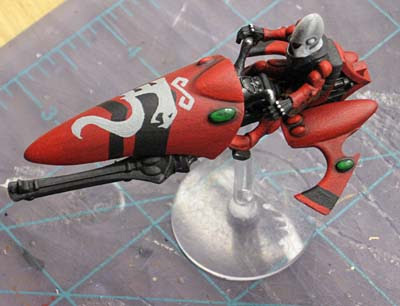 Thanks guys, even with a simple scheme like this , they are still taking a little while to finish. The details end up getting you.